Because I want the real Barca experience. We think so. This cool studio flows. From the semi-independent bedroom, into the compact kitchen, and out onto the terrace. Oh yes, a terrace. You'll love early morning coffees in your private outdoor area. It's even set up with a small table and chairs. We think it's perfect for professionals looking for a lively but authentic Barca barrio. Whether you work in the city, or from home, this spot has you covered. The sleeping area has a funky little divider. Gràcia is your charming, lively hangout. The kitchen is simple. However, it'll be hard to resist the urge to eat out around here anyway. 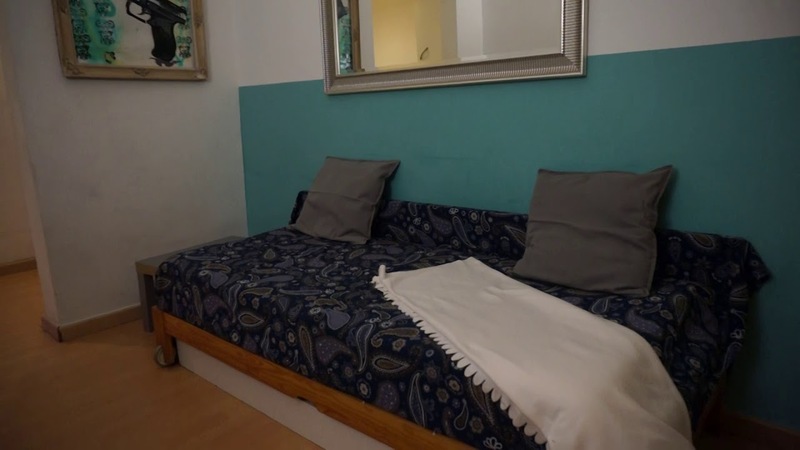 This is a beautiful 1st floor, studio apartment on Carrer de Bruniquer, Barcelona. It's well laid out, and has all the basics. From the double bed, to the kitchen, and out onto the terrace. Everything you need. This location is ideal for students or professionals. It's one of Barcelona's most charming spots. Just outside the tourist shuffle, but with plenty of life. Smokers are welcome, but only on the terrace. Exploring the bars and boutiques of this village-like barrio. Rolling out of bed, and straight into the living room. Who needs walls? Sipping on Vermouth on your terrace. The washing machine and dryer are located in a common area. No more trips to the laundromat for you. Out of hours check-in: €20 (after 22:00), €40 (after 24:00).